Whether your destination is down-home Country or simply unplugged, announce it to the world. 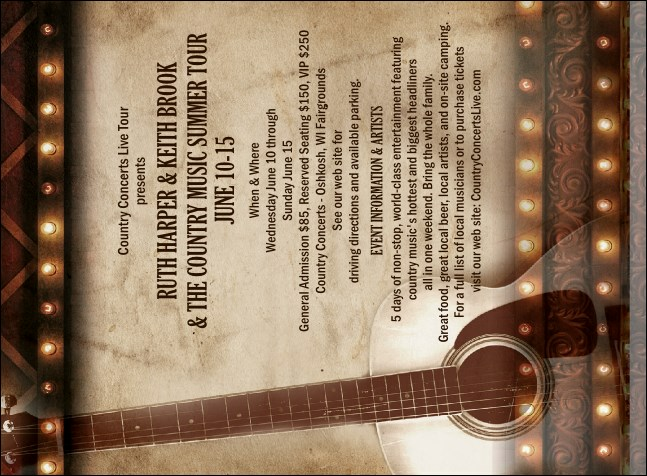 Stage lights and a big guitar form the background for this invitation for a country music concert, which matches the rest of the Natural Riffs Event Kit. Draw a crowd with the right invitation template for every event from our huge online gallery of original designs. Country & Western, Blues, Jazz, Rock & Roll, Hip Hop, or Classical, TicketPrinting.com has the Event Kit for all your concerts.